Sorry... the 2017 Nissan LEAF is no longer being sold as new. Instead, take the first step to a great deal on 2019 Nissan LEAF with a free price quote! 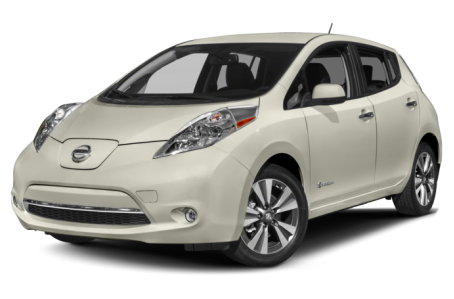 The 2017 Nissan LEAF is an all-electric hatchback that seats 5 passengers. It competes with the Ford Focus Electric, Chevrolet Volt, and BMW i3. Three trims are available: the S, SL, and SV. The LEAF has a soft, bubbly appearance that contrasts the current trend of sporty, aggressive designs. Abnormally large, pointy headlights are stretched along the hood. Thin, curved tail lights are mounted at the D-pillars. Power/heated side mirrors and a rear spoiler come standard. Optional features include automatic LED headlights, fog lights, 17-inch aluminum-allow wheels, and a solar-panel rear spoiler that charges the vehicle’s accessories. This year, all LEAF models are driven by the same 107-hp, 80 kW AC synchronous electric motor paired with a 30 kWh lithium-ion (Li-ion) battery to achieve a 107-mile range. The 30kWh battery can be quick-charged to 80 percent in 30 minutes. For even faster charging, an optional 6.6 kW onboard charger can replace the standard 3.6 kW onboard charger. Inside, the LEAF has an upscale, black interior with digital instrumentation, heated front seats, and a 60/40-split folding rear seat. It has a maximum cargo capacity of 30 cubic feet with the rear seat folded down. The center console features a standard multimedia system, which includes a 5-inch display, CD/MP3 playback, Bluetooth connectivity for phone and audio, and a USB port. It can be upgraded to the NissanConnect that has a larger 7-inch display, an integrated navigation system, a mobile app suite, and a Bose premium audio system. A tilt/telescoping steering wheel, push-button start, and cruise control come standard. Leather-trim or synthetic suede upholstery, heated rear seats, and a heated steering wheel are also available. Standard safety features include an advance airbag system, antilock brakes, an electronic stability system, and a backup camera. An Around View Monitor is available as well. 12 of 13 (92%) consumers said they would recommend this vehicle to a friend.